***(SOLD)*** Vintage Handwrought 14k Gold Angelskin Black Coral Pearl Brutalist Ring - Marked 14K, tested and guaranteed solid 14K yellow gold with its original maker mark as shown in photo. 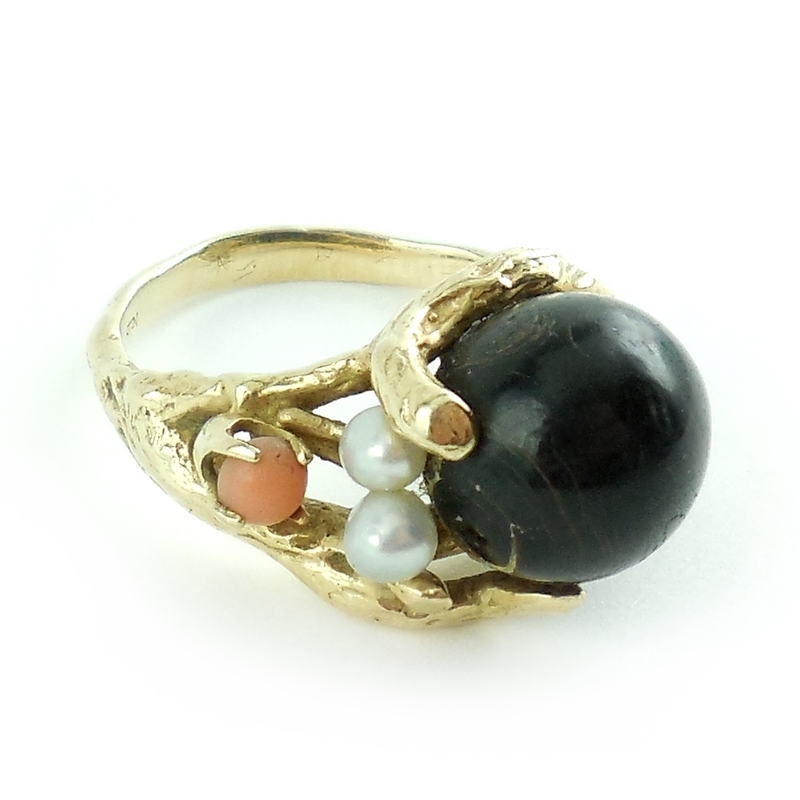 This is a lovely vintage 1970s modernist, handmade, hand wrought brutalist ring in solid 14k Yellow Gold with natural angelskin coral, natural pearls and a natural undyed black coral ball in the center. The black coral is 11m across and has natural inclusions and characteristics and one natural open section that you can see in the photos below. The angelskin coral and pearls are small accents to the large black coral ball. The coral and pearls are set in the brutalist forms that resemble coral branches. Very pretty and very well made. Ring size is 7 1/2. Weight is 5.4 grams. Condition is excellent. This is a beautiful artistic vintage modernist statement ring for your collection. 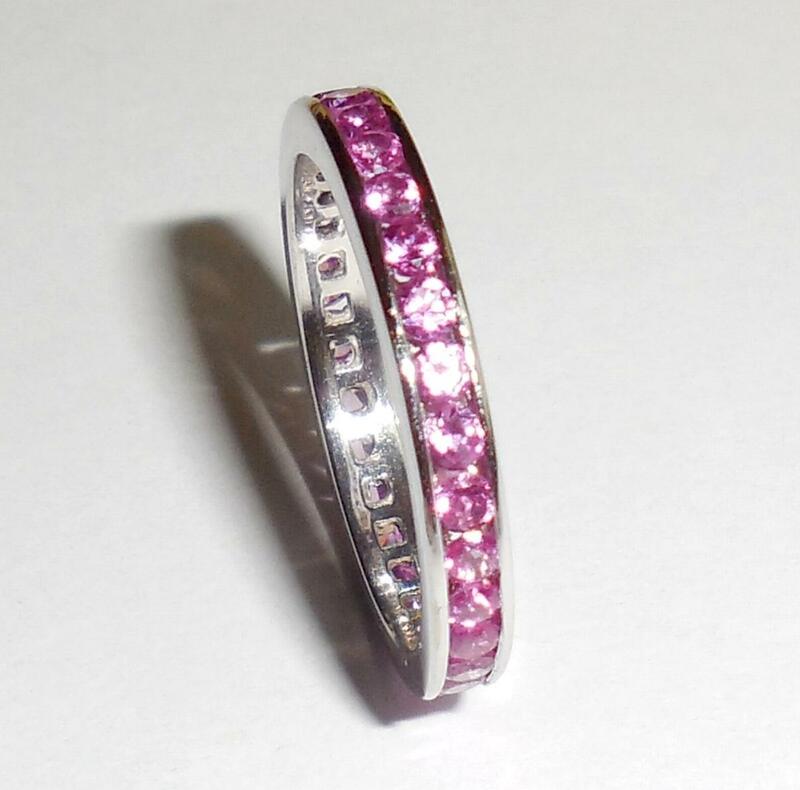 ****(SOLD)**** 14K White Gold Pink Sapphire Eternity Ring Band 6 Metal: Solid 14k white gold Gemstone: Pink Sapphire, Fine quality gem grade Carat Weight: Approximately 1 carat Ring Size: 6 Weight: 2.3 gr Please see photos and read full product description. Feel free to email with any questions. Condition: Gently used, beautiful, crisp, clean condition. 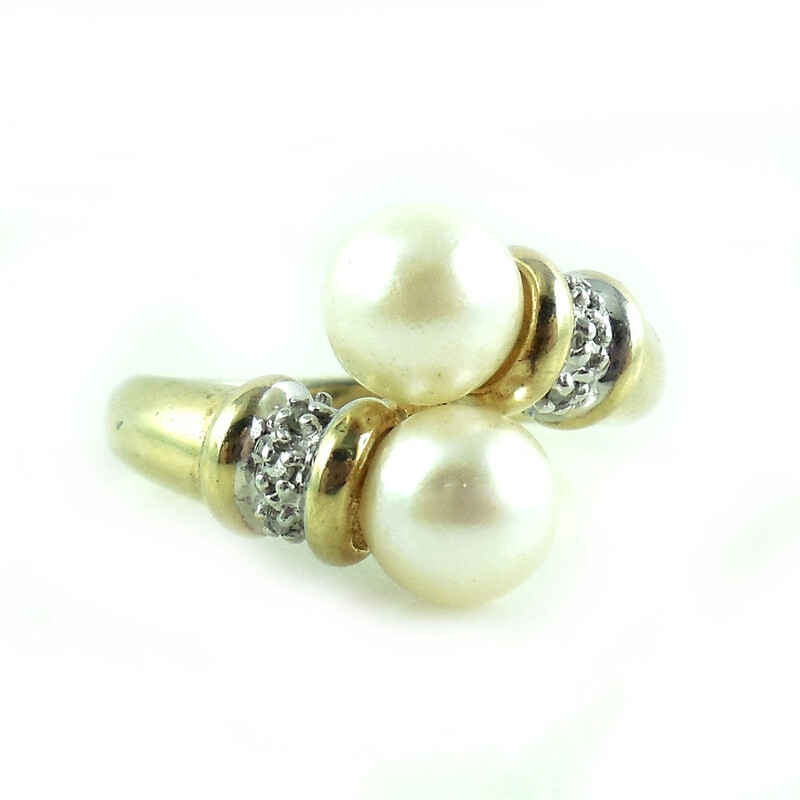 10k Gold 4.3Gr Twin Pearl Diamond Collar Ring Size 7 Gorgeous Showy Chunky Heavy Vintage 10k Gold 4.3 Gr. Ring Size 7 10K Yellow Gold Vintage round cream white cultured Diamonds Accent Collars Please view the photos and read the product description below for further information! 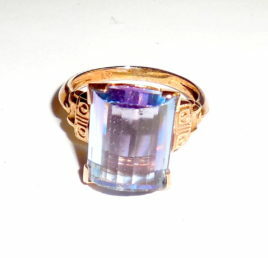 10K Rose Gold Man Made Violet Blue Color Change Estate Ring Size 5.5 - Vintage 1960s-1970s mid century estate ring in solid 10K rose gold with a man made color change half cylinder cut stone in the center. It is marked 10K, jeweler tested and guaranteed solid 14K gold. Setting is late Art Deco geometric rectangular basket mounting with broad corner prongs and open half moon circles on front and back. There are also small full circles engraved on the sides and encapsulated in rectangles with very tiny fancy cut work on the edges. Ring Size: 5 1/2 Size of Top Box Mounting: 3/8″ by 8/16″ This includes the frame around the bezel. Stone: Man Made Violet to Pale Blue Cut: Faceted half cylinder or barrel cut. Beautiful, unusual look with lovely flash. Stone Size: 7/16" by 3/8", (11mm by 9.5mm) Weight: 4.1gr Condition: Stone has minor edge wear that is not eye visible; found with a loupe. Otherwise, excellent overall condition. No wear to the gold. Band is still solid and strong. Bottom of band is still a full 2mm. No dents or dings to the gold. No scratches. No age wear. Very gently used. Never altered or modified. No prior resize. You can tell this is an older vintage ring as the band/shank tapers outward to a sharp cut surface while the inside of the band is flat. 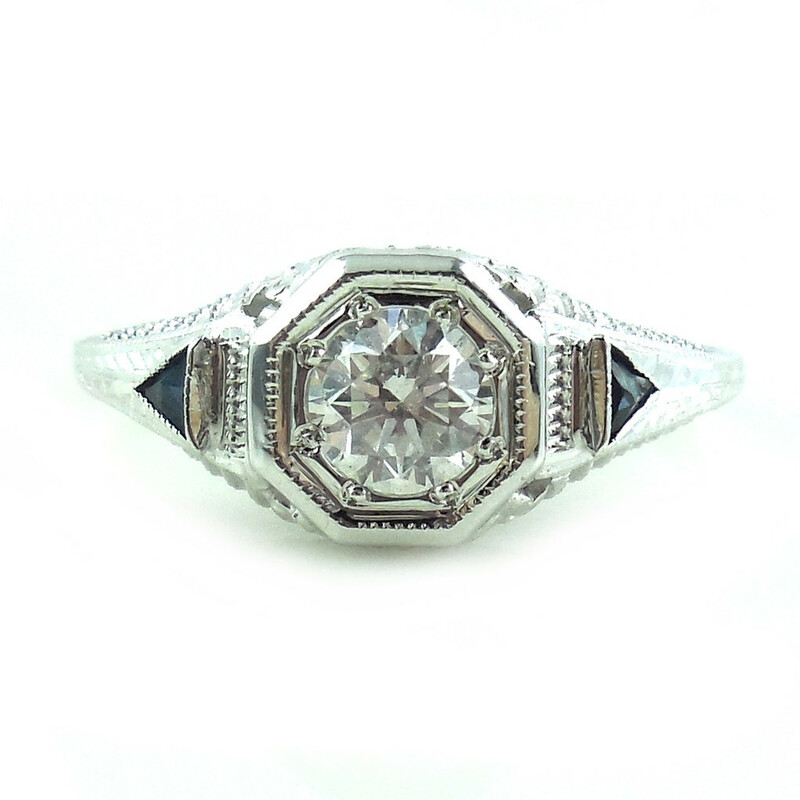 This is a beautiful, delicate estate ring for your collection. 14K Gold AA Gem Ruby Stacking Ring Band Stacker 6.5 Maker: Gabriel & Co., NYC Metal: 14K White Gold (solid) Ring Size: 6.5 6 1/2 Weight: 2 gr. Gemstones: Natural Double AA to Gem Grade quality Rubies Total Gemstone Carat Weight: Approximately 1/2 Carat, .5CT Condition: Good as New Width: 1/16" across (narrow) Please see photos and click to read product description for more information. 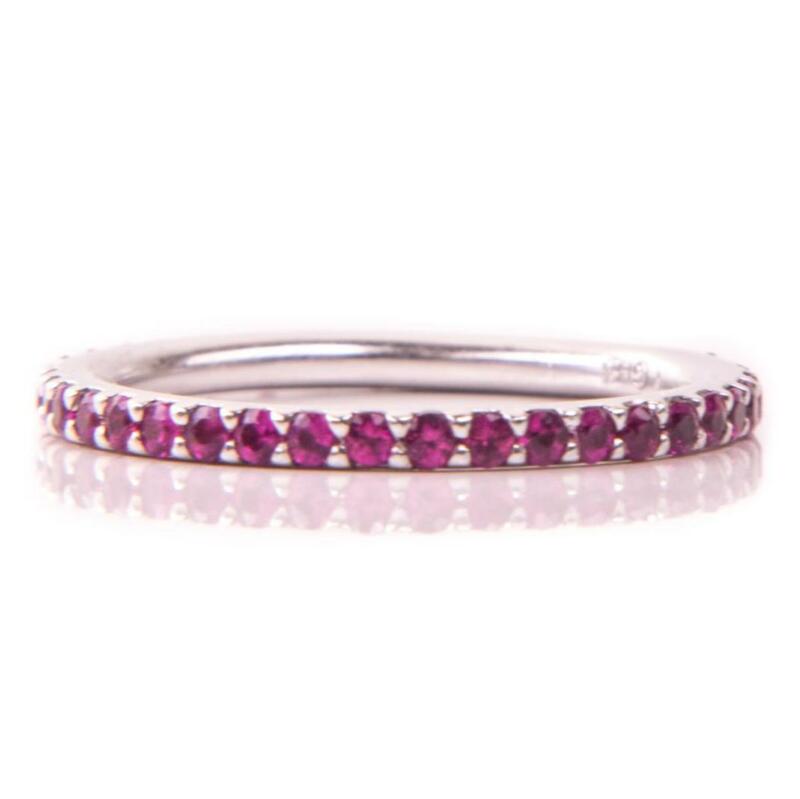 This is an absolutely stunning natural ruby 3/4 eternity ring band for your collection. The gemstones are very high quality and stand out in color and clarity so much that this looks great all by itself without other stackers!! 14k Gold Diamond Mid Century Ring Band 8.25 Vintage Mid Century Diamond Ring Great for wedding ring band stacking ring band stacker ring Metal: 14K Yellow Gold Band 14K White Gold Top Setting (Solid 14K gold) Ring Size: Large 8.25 Weight: 2.6 grams Total Carat Gemstone Weight: Approximately .2 CT Condition: Excellent. No damage or repair. Please see photos and read full product description below for more information. 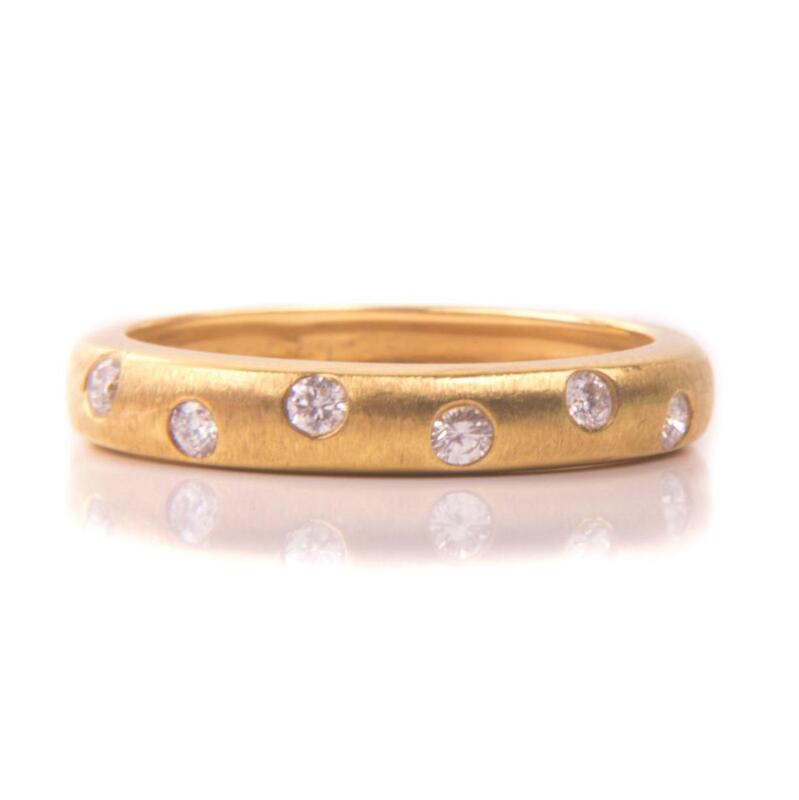 This is a lovely, early vintage, narrow ring with lots of small bright sparkly diamonds, Great for stacking!! Sorry for the photo glare reflection. 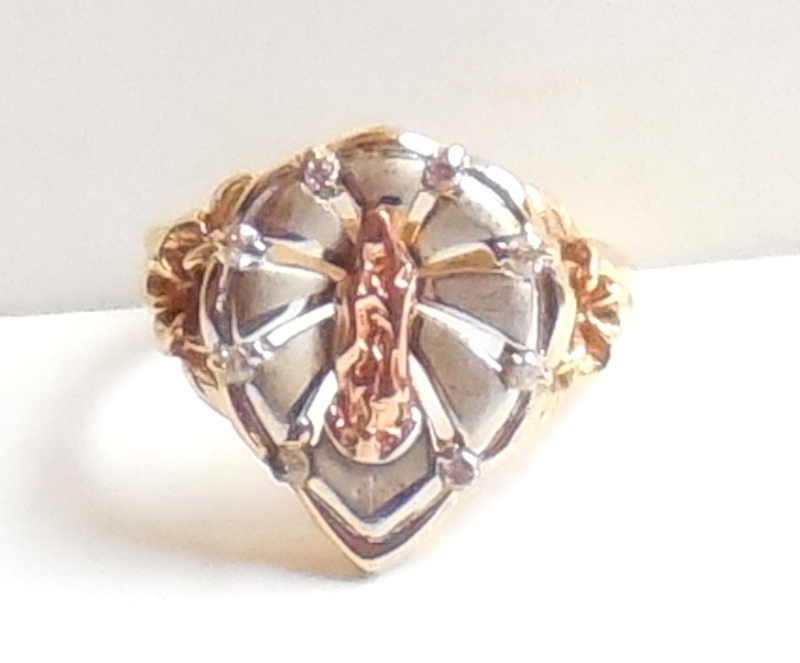 This ring is in excellent condition having only light surface wear that is Not eye obvious when the ring is worn on the finger........This is a gorgeous vintage 14k Gold Miraculous Mary Diamond Ring Christian Catholic, size 7.75. 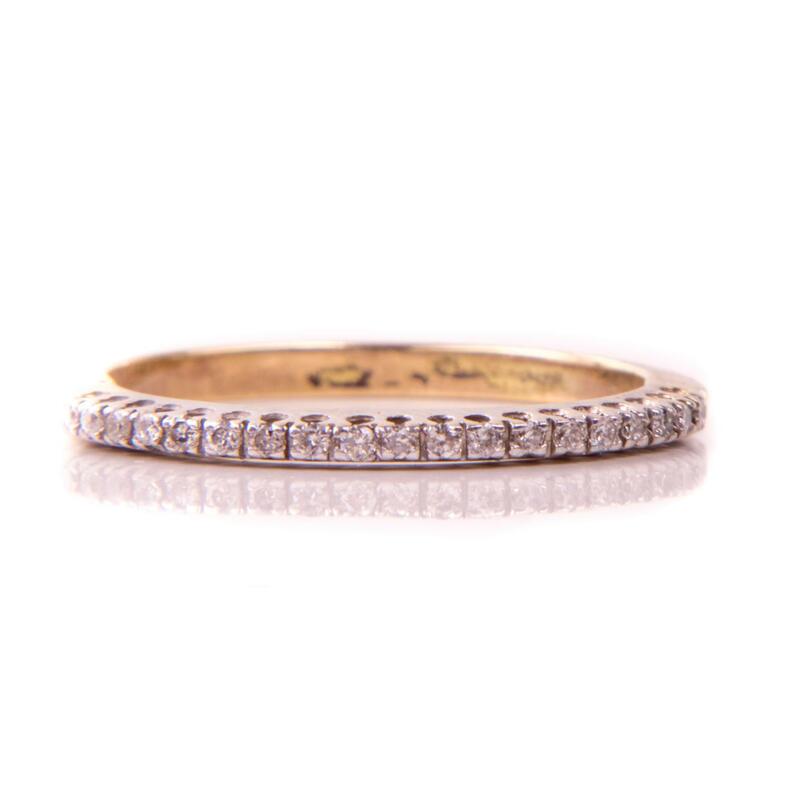 It is solid 14K Yellow Gold, Rose Gold and White Gold with .015 carat sparkly single cut diamonds. Ring size is 7 3/4. Weight is 4 grams. Size of top is 5/8″ North South. The enlarged close up photos show you some light faint surface wear. This is NOT eye catchy at all. There are no deep scratches or gauges. No tears or holes. Overall, excellent, gently used condition. The black lines you see in photo are from photo glare reflection. this 14k Gold Miraculous Mary Diamond Ring Christian Catholic is a beautiful addition to your Christian jewelry collection. It is thick, solid, showy and strong. 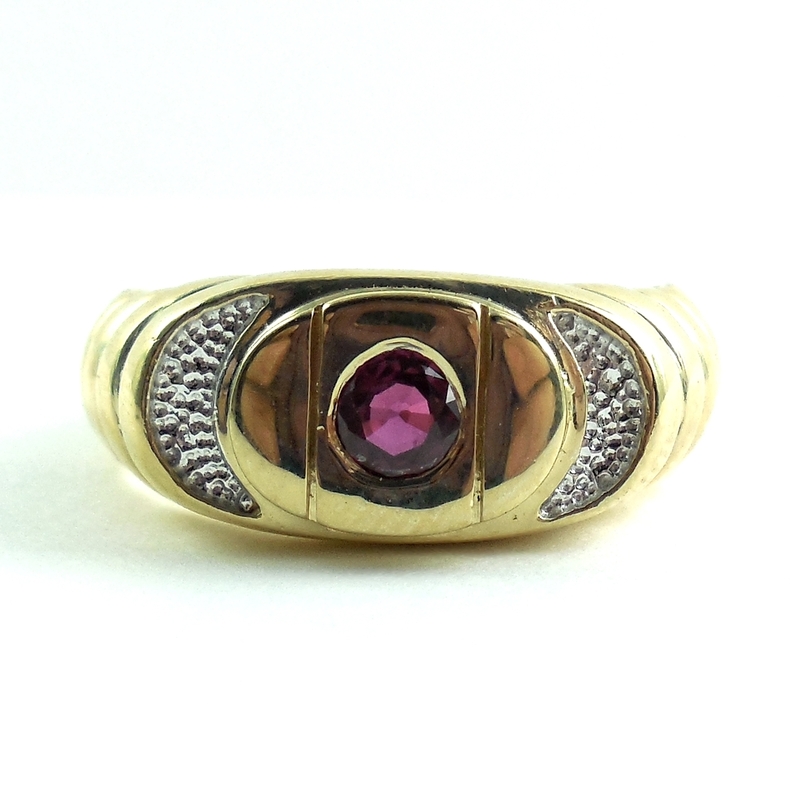 14K Gold Ruby Diamond Stationary Buckle Ring Band Size 6.5 - Marked 14K, tested and Guaranteed solid 14K gold this is a stunning ruby and diamond gemstone non moving buckle ring. It also has maker markings of NN. Total carat gemstone weight is .5 carat. Gold weight is 3.9 grams. Width across the wider curve on the top is 7/16" north to south. Condition is excellent, very gently used. No damage or repair. All bright noticeable rubies and diamonds. 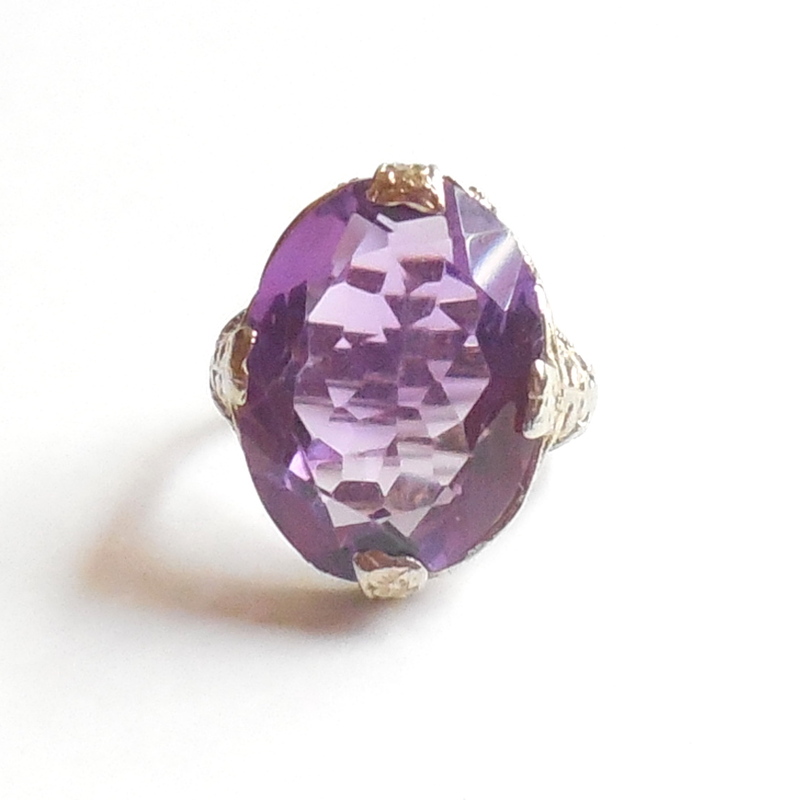 A gorgeous gemstone ring for any occasion it is very, very pretty and showy! 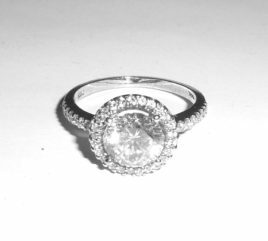 14K White Gold CZ Diamond Ring Setting Jeweler Sample - Gorgeous ring setting used by the jeweler so the bride to be could see how her diamond will look once she has picked out her stone. It is marked 14K on one side and also has maker marks on the other side inside the shank. Guaranteed solid 14K white gold. The top holds a center 8.5-9mm CZ. It is surrounded by brilliant czs that extend down the shank. Ring size is 8. Weight is 3.5 grams. Condition is like new. No damage or repair. Nice, thick, solid shank and setting. The undermount has eternal open fililgree hearts on the front and back; a full heart cut out in the center on each side and half hearts eternally extending outward on both sides. Very pretty design. The top measures just about 1/2" across east to west and sits 1/4" tall. 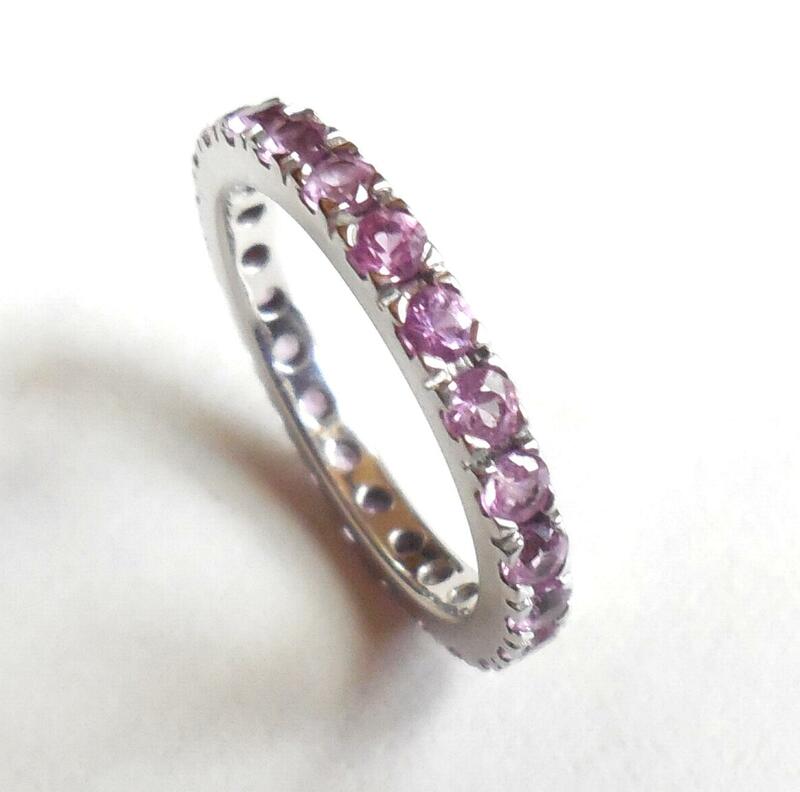 This is a gorgeous ring for any occasion! 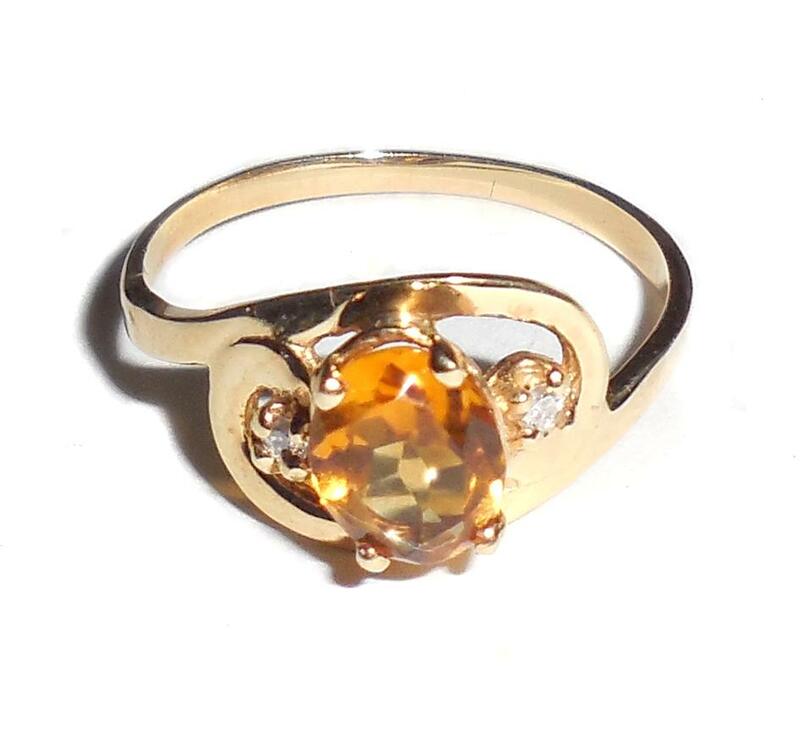 In a ring size 7 and for a small to medium sized hand this is a vintage 1980s late mid century 14K yellow gold natural honey amber citrine and diamonds ring. It is marked 14K jeweler tested and Guaranteed to be solid 14K gold. It has a noticeable mid century modernist swirl design with a juxtaposed shank. The citrine has strong honey amber color, is very sparkly, very clear and measures 8mm. Total carat gemstone weight including the accent diamonds is 1.15 carats. Design is a little on the delicate side and looks good on a small/medium hand, pretty. Weight is 2 grams. Condition is excellent, very gently used. No damage or repair. No alteration. No resize. No chips or cracks or inclusions. Light age wear to the band but no dents or dings or wearing down. Able to be used daily. This is a beautiful 14K yellow gold honey amber natural citrine ring, size 7, for your collection! Please make sure to read our product description and see our photos for more information. 14K Yellow Gold Ruby Rolex Style Ring Band Mens Womens Size 9.5 - For men or women this is a lovely 14K gold and natural ruby ring with an oval modernist design top and Rolex style band in excellent ready to wear condition. It is marked 14K with a maker mark; also jeweler tested and Guaranteed to be solid 14K gold. Excellent, like new condition. No damage or repair. Very bright and clean. Never altered in any way. Rarely used. Ring size is 9 1/2. Weight is 5.7 grams. The top measures 3/8″ wide across North to South. The ruby is natural and measures 4.5mm across and weighs approximately .45 carat. It is fully faceted, bright and sparkly with decent clarity and color. You can clearly see the facets in the stone. The color is deep red color with fuschia highlights and is noticeable. 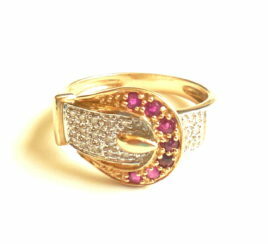 This is a lovely well made ring for your collection. Extra Large Size 18K Gold Diamond Ring Band 10 size Style: Gorgeous etoile set diamonds directly set, embedded into the gold Metal: Solid 18K Yellow Gold, Jeweler tested, guaranteed. Weight: 6.3 gr Gemstones: Natural Diamonds High Quality VS1-2, F/G Near Colorless Color Total Carat Gemstone Weight: .3CT (about 1/3 carat) Condition: Excellent. No damage or repair. Finish: Brushed Florentine Type Hand Jeweled and Hand Cast this is a gorgeous oversized ring band with very high quality "goods" for your collection! 1930 Art Deco 14K Gold Diamond Eternity Ring Band Stacker Stacking - Antique and Vintage Estate Jewelry in completely original, excellent condition. This is a gorgeous early transitional Edwardian to 1930 Art Deco diamond ring band in solid 14K gold. Top is 14k white gold. Band is 14K yellow gold. It is jeweler tested and guaranteed solid 14K gold with all of its original, early single cut stones intact. No mark so you know it is an early one. The stones are natural mined diamonds that were never enhanced, irradiated etc....all natural from the earth. They are set into bezels that have open slits at top, sides, and bottom for light. This is an early transitional setting prior to individually prong set stones and after the turn of the century full bezel set stones. Nice early setting and looks very pretty with the yellow white gold mix. Ring Size: 8 1/2 . 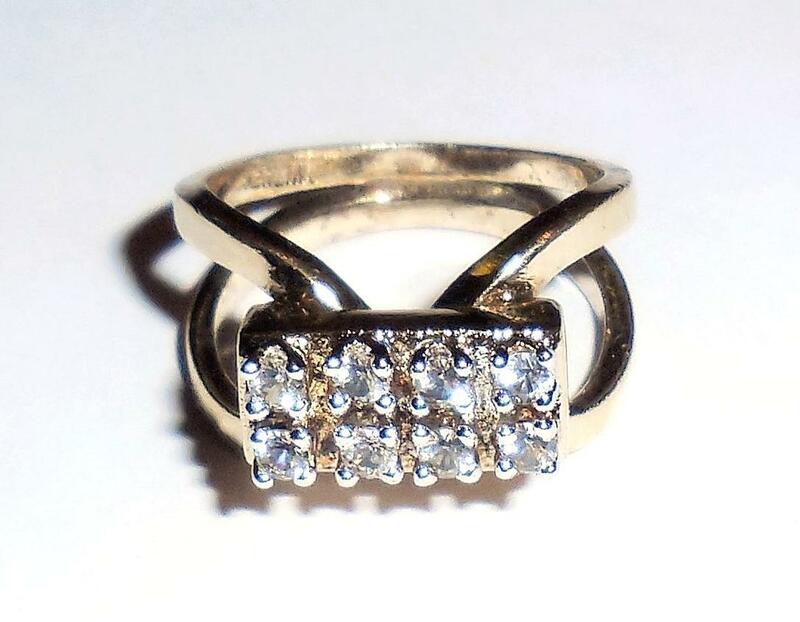 (Unusual to find these early rings in this larger size; usually they are very small) Weight: 2.7 grams Total Carat Diamond Weight: .5 Carat Early Single Cuts Width Across: 3.2mm Condition: Completely original, excellent. No damage or repair. Never altered or modified. No wearing down of the gold. All good stones. Entire band is still very thick, solid, and strong. Able to be worn daily. 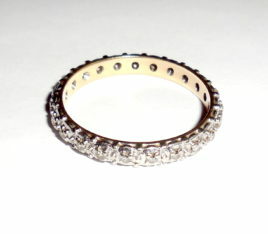 Lovely eternity ring band or stacker. 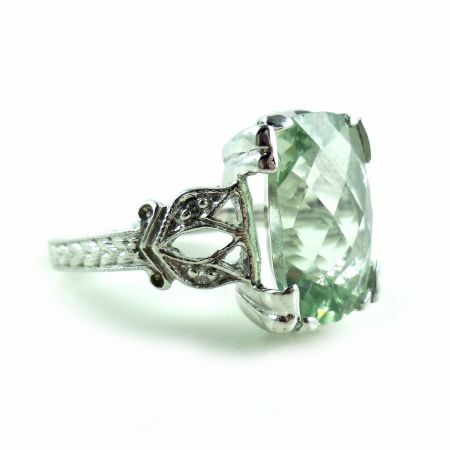 Absolutely gorgeous 1930 Art Deco 18k White Gold Diamond Sapphire Ring Estate Find. The top holds a wonderful, high quality, early brilliant cut natural diamond with lots of sparkle. Super eye clean, high grade VS2/SI1 (very slightly imperfect) diamond flanked by it original, hard to find, tiny triangular cut sapphires. Total carat gemstone weight is .52 carat. Please click to see all photos and read the ad description for total specifications. A gorgeous early Art Deco find for your collection! Vintage heavy gold plated over 925 sterling silver block cluster modernist ring. Vintage 1970s Mid century Modernism Gold over Sterling Silver rectangular block CZ ring with a modernistic gyroscope setting. Marked and guaranteed to be solid sterling silver. Some age wear to the band. Other than this it is in excellent condition. Ring size is 6.5. Design: Thick strong chunky design with broad open spaces on the sides of a double band. Construction: Very thick, solid, well made and hand jeweled. Top Measurement: The top is 7/16" long East to West by 1/4" wide across North to South. Shoulder to shoulder band to band is 11/16".